Paper birthday cards that are simply sensational. Is that what you are looking for? Every greeting card's so beautiful, you'll want to keep them all. Make it yourself then! That's right! If you want your birthday greeting cards to be special and unique, you'll just have to make them yourself. Feel that you can't achieve that professional look? It's okay! I thought so too once. But then I discovered rubber stamps and with a little bit of practice, every card I make can be as stunning, elegant and professional as any Hallmark cards. Making my own birthday greeting cards can be so exciting. Every birthday greeting card is carefully planned with the birthday person in mind. Her favorite color, her style and her favorite things; for example, pastimes and pets are taken into consideration for creating that perfect birthday greeting card. Once the design is in your mind, then begin to execute it by bringing out your card making supplies. Rubber stamps, cliparts, ink pads, embossing powder and paper. Find co-ordinating colored paper that are of good quality. Then start to make the birthday greetings. That's when the excitement begins. I can spend my whole day making greeting cards alone in the house. Sometime, I got so engrossed in my card making that I forgot to break for meals. And by the time I have finished making the card, I was famished. Truly, it happened to me many times and I'm sure it will happen to you too once you got into card making. Try it! Instead of going out to look for that stunning birthday greeting card for a friend or family member, make it yourself. Below are some birthday cards I have created. Have a look and see whether these will inspire you to make some. Have fun! Small birthday tag with decorated envelope. Suitable to accompany a birthday gift or to include money for a gift. This is a very simple card. Instead of the standard rectangle card, I use a triangle shape. Notice that only one color is used to make this card. What's more appropriate than to send birthday greetings with a big flower to a girl friend who loves flowers. Actually, this flower birthday greeting card is suitable to be made for most women including young girls. I made this card using clear rubber stamp images and a flower die-cut which I produced using my QuicKutz die-cutting machine. Three flowers make up this happy birthday greeting card. I used bright colors to give it an uplifting happy feeling. This is a relatively quick and simple card to make . See the cute bug sticker embellishments. This is an interesting birthday greeting card. I bought the die-cut paper from a local scrapbooking store and have been wondering how I can incorporate it into my cardmaking. Well, this is one of the ways I use this rather expensive scrapbooking paper. 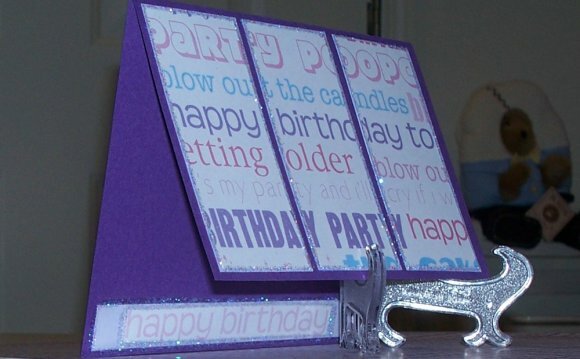 How to make a pop up Birthday Card?